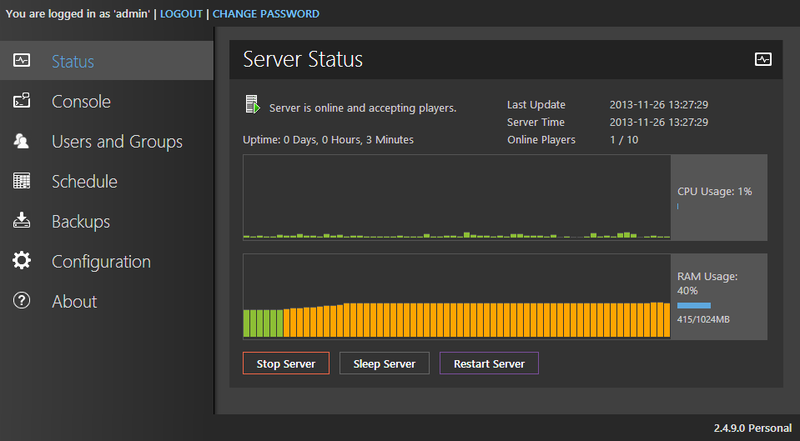 McMyAdmin Status screen. Everything you need to know about your server at a glance. McMyAdmin is the leading web control panel and administration console for Minecraft servers, trusted by over 75000 server admins and more than 35 different service providers. McMyAdmin makes it easy for you to control your Minecraft servers via it's straight forward user interface and mobile apps. * Supported OSs only. BSD, Mac OS and 32-bit Linux systems require the Mono Runtime. Java is required to run the Minecraft server itself. 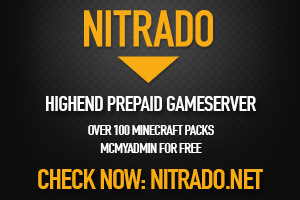 More than 75000 Minecraft servers worldwide are powered by McMyAdmin. So what's in it for you? We work with Dionach - a leading CREST approved independent information security specialist to ensure that McMyAdmin complies with best security practices and is as secure as possible against potential attacks. No webserver to configure, no database to set up. McMyAdmin includes almost everything you need to get going quickly and with minimal fuss. Most common administrative tasks can be performed via the friendly user interface, no need to edit text files or write scripts. McMyAdmin Personal includes almost all the functionality of McMyAdmin Professional, allowing you to see how great McMyAdmin is before you buy. See the Editions page to compare versions. McMyAdmin has enjoyed the benefit of over 3 years of updates and improvements, and continues to get regular updates to add new features, support new mods or support the latest version of the Minecraft server. Anyone can suggest new features or changes they'd like to see in McMyAdmin via our support page. If it gets enough votes, we start looking at how it can be brought on board. So far we've brought on over 60 user suggestions into McMyAdmin. No complex licencing systems or provisioning requirements. McMyAdmin is easy to manage in either VPSs or shared-hosting environments. Fully configurable via command line arguments for ease of deployment. Works on both Windows Server and GNU/Linux based servers. Users can perform most common administrative tasks such as performing updates, installing plugins or changing the server configuration without ever having to touch a configuration file, it's all kept plain and simple. This translates into fewer support requests and less downtime from user issues. Under these operating systems, the Mono framework is required to run McMyAdmin as there is not a native version of McMyAdmin available for these platforms at this time. For MacOS or openSUSE you can download Mono from the Mono Project download page - for 32-bit Linux and BSD, you install it via your distributions package manager. Note that you must change to the directory McMyAdmin is installed to before running it. You cannot run it using a relative or absolute path. Once McMyAdmin is running, you can connect to the web interface on http://localhost:8080 if it's running locally, or ar your servers external IP address on port 8080. Otherwise consult with your Linux distributions documentation for how to manage the firewall. If you paid using an eCheque or other non-instant payment method, your licence key will be sent as soon as your payment has been cleared. If you used an instant payment, your licence key has been sent to the primary email address associated with your paypal account. In most cases you should receive your key almost instantly, but please allow up to an hour for delivery. You can manage your McMyAdmin licences at the CubeCoders Licencing Portal. Thanks for your support, and enjoy McMyAdmin. Once you've recieved your key, you can add it to your McMyAdmin installation via About -> Updates in the control panel. Please ensure that you are running McMyAdmin 2.4.1.0 or newer before purchasing, as we have recently updated our licence system. You will be able to specify your order quantity on the next page. Once the purchase has been completed, your licence key will be sent to the primary email address associated with your paypal account. You can check what this is during the checkout process. If you pay using an eCheque or other non-instant payment method, your licence key will be sent as soon as your payment has been cleared. Your licence isn't tied to a single server and you can move it around as often as you like. You can also recover your licence at any time should you lose it via the key recovery page. 20% VAT is included for purchases inside the EU. If you're getting a message inside McMyAdmin that your licence failed to migrate, try logging into the Licence Manager, making sure to try both the email address currently on your paypal account (rather than the one you originally used to pay) and the one currently shown on your licence. From the licence manager you can get your new key, which you can enter into your McMyAdmin.conf (or you can remove the old key from McMyAdmin.conf and activate as normal). The licence was bought by someone else on my belhalf. I don't have access to the email address used. You should not include the long encrypted key shown in McMyAdmin.conf as we cannot decrypt them. How can the licence system know my new email address when I never gave it to you? To migrate old licences into the new system, we requested a transaction log from Paypal. The logs they give us include the current email address on your account rather than the one on your account when you originally made the purchase. Why does my licence need migrating? In April 2014 CubeCoders (the company that owns and develops McMyAdmin) rolled out a new centralized licence system to be used across all CubeCoders products. The new system was required to perform tasks such as generating formal invoices and VAT receipts for EU countries, and allowing CubeCoders and users better control over product licences. In order to avoid having to maintain two separate licence systems, the old system is being shut down and all licences were moved over to the new system. When was the old system shut down? The sale is of a licence along with a licence key to use McMyAdmin Professional Edition. It may be used with as many instances of the McMyAdmin software as have been purchased. For example, running two instances of McMyAdmin Professional on the same computer requires two licences. You are not buying a copy of the McMyAdmin software in of itself, nor are you purchasing a physical item. McMyAdmin Professional licences are for non-commercial, personal use by an individual or organisation. McMyAdmin licences may not be resold, loaned or transferred to another person or organisation without the express written permission of CubeCoders Limited. You may not sell or supply servers or services to other persons with McMyAdmin installed without a commercial usage agreement. If an issued licence key is used in a manner other than prescribed in this agreement, CubeCoders Limited may revoke and disable all licences owned by the customer without notice. In the event of a payment dispute such as a chargeback or reversal, CubeCoders Limited may revoke and disable the licence along with any other licences owned by the same person or organisation. Refunds and exchanges are issued at the sole disctretion of CubeCoders Limited. There is no fixed policy on when refunds or exchanges are issued and each request is evaluated on a case-by-case basis, however in general refunds are not permitted except for exceptional circumstances. Refund requests resulting from technical issues using the software will generally not be accepted unless absolutely all avenues of support have been exhausted, as users are free to evaluate the software before purchasing a licence. Technical support is freely available to all users. McMyAdmin is digitally delivered the instant the payment is received for instant consumption, and as such is exempt from EU distance selling regulations. Once you use your licence key, you waive your right to the 14 day cooling-off period. Official support is available Monday to Friday, between 10AM and 4PM GMT. This excludes UK bank holidays. I am an authorized representative of the company listed above, and I am at least 18 years of age. McMyAdmin Enterprise licences permit the holder to distribute McMyAdmin installations, or provide servers with McMyAdmin pre-installed on them for use by their customers. The licence also unlocks special enterprise-exclusive features, such as LDAP based authentication, host login access (without needing the customers login details), the ability to force settings upon the Minecraft server despite changes made by customers, and greater API access to ease server configuration. If you represent a qualifying school or educational facility, you can use McMyAdmin Professional for free! The facility must be purely state funded, recieving no financial assistance from corporations, students, or any other sources. McMyAdmin must only be used for Minecraft servers used in an educational setting. This excludes usage such as video-games clubs. The McMyAdmin installation must be either on-site or on a server rented/owned by the facility administration. You must have a private .ac/.edu/.gov or similar email address. Freely available email addresses that anyone can obtain will not be accepted. You must be a teacher, lecturer or faucilty member. Students are not able to apply for this offer. If believe your facility is eligible, you can request more information via the contact form. Your full name and job title. The full name of your school or facility, including its postal address and website. A short paragraph about how you intend to use Minecraft in an educational context. Note that requests that do not include the above information will not be accepted. Please note that this is not used for technical support and is intended primarily for billing issues or commercial enquiries. Typical turnaround is 2-3 working days. Thank you for your enquiry. We'll try to get back to you as soon as possible. Educators get McMyAdmin for free! Learn More. * The personal version also announces "This server is running McMyAdmin Personal" to connecting players.